Objectives: We have shown that neuronal activity in the subthalamic nucleus (STN) in patients with Parkinson's disease can be accurately recorded during deep brain stimulation (DBS) with general anesthesia (GA). However, a vigorous passive range of motion (PROM) test might exert awakening effects on patients who are lightly anesthetized. We will explore the effects of PROM on the heart rate (HR) and mean arterial pressure (MAP) during microelectrode recording (MER) and confirm whether it facilitates identifying the sensory motor portion of the STN under GA. Materials and Methods: 3T magnetic resonance image targeting of the STN was done to guide MER during frame-based stereotactic procedures for DBS. 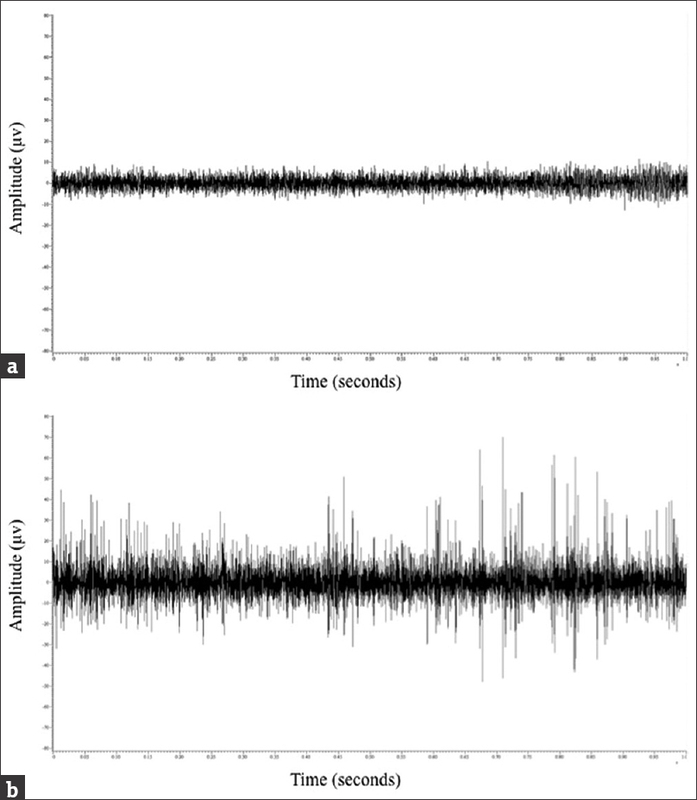 Regular induction and endotracheal intubation for GA were performed and then maintained with a volatile anesthetic agent and muscle relaxant only. The depth of anesthesia was monitored by the bispectral index (BIS). Results: A total of ten patients were enrolled in this study. Their mean age was 48.5 ± 10.8 years old with a disease duration 8.6 ± 2.4 years at the time of surgery. During MER, PROM significantly decreased recording tract numbers and still reached the STN at a recorded length at 5.5 ± 0.8 mm. Compared with baseline, PROM increased HR by a mean 0.5 beats/min and MAP by a mean 1.4 mmHg (P = 0.1178 and 0.0525). The change in BIS was −0.7 (P = 0.4941), and the mean alveolar concentration of the anesthetic agent changed little throughout surgery. Conclusions: PROM was effective in triggering and magnifying neuronal firing signal without influencing patient awareness during MER for STN-DBS under GA. Conventional deep brain stimulation (DBS) surgery for Parkinson's disease (PD) requires a patient to be awake to obtain proper neuronal signals during microelectrode recording (MER) and to perform test stimulation,,. Nevertheless, patients with intractable medication off symptoms may not tolerate a prolonged awake surgical procedure. These off symptoms may include tremor, rigidity, and choking by drooling in the advanced stage. Thirty years after the first DBS procedure in a PD patient, changes are occurring in the paradigm in approaching DBS surgery, especially in the choice of anesthesia regimen, to improve the comfort of patients without jeopardizing outcomes,. Identifying the sensory motor portion of the subthalamic nucleus (STN) is crucial during MER for optimal final electrode implantation. Passive range of motion (PROM) of the patient's limbs enhances neuronal firing during MER of the sensory motor region of the STN. In our previous research, we proved that MER can be adequately performed while the patient receives desflurane under general anesthesia (GA), and the improvement in PD motor function was comparable to patients who underwent local anesthesia,. Nevertheless, more vigorous PROM may be needed to trigger neuronal signals effectively during GA than during an awake procedure. During GA for DBS, the end-tidal anesthetic concentration is usually maintained between 0.5 and 1.0 minimal alveolar concentration (MAC), and the anesthetic state is monitored by the patient heart rate (HR) and blood pressure. Nevertheless, unresponsiveness in motor activity is not equal to unconsciousness of an anesthetized patient,. A combination of electroencephalography, electromyography, and standard vital sign measurement could be more realistic in monitoring the depth of anesthesia to ensure the quality and safety of GA ,,. In this study, through continuous monitoring of the depth of anesthesia through the HR, mean arterial pressure (MAP), bispectral index (BIS), and minimal alveolar concentration (MAC) of the volatile anesthetic agent, we tried to clarify if vigorous PROM exerts awakening effects on patients who are lightly anesthetized. The goal is to find the most effective way to identify the sensory motor portion of the STN without influencing the depth of anesthesia during MER. This was a prospective cohort study of ten PD patients who underwent STN-DBS surgery. This work was approved by the Institutional Review Board of Tzu Chi General Hospital, Hualien, Taiwan (TCRD 104-35, IRB 103-122-A). Ten patients who received GA during STN-DBS for PD were enrolled in this prospective study. The image fusion technique was applied in all cases. On the day of surgery, computed tomography (CT) of the brain was performed axially, in 1.25 mm intervals, with a stereotactic localizer. The standard 3T magnetic resonance (MR) images' (GE, 3.0 Tesla, USA) settings were T1 three-dimensional fast spoiled gradient echo (FSPGR) axial images of 1.0 mm thickness, with and without contrast enhancement and T2 FSPGR (T2W FSE) axial images at a 2 mm thickness. Each of these sequences was performed in contiguous slices. All images were transferred in a DICOM database through the PACS system to an S7 workstation (Medtronic, Minneapolis, MN, USA). Image fusion software was used to fuse all sets of MR images to CT scan images. The tentative surgical target coordinates for the tip of the permanently implantable electrode were set at the central lowest border of the STN through direct visualization on MR images and adjusted with indirect coordinates. A Leksell G-frame (Elekta Instrument, Inc., Atlanta, GA, USA) was used for the stereotactic procedure. The patients rested comfortably on the operating table in a supine position with the head ring secured on a Mayfield adaptor. The target coordinates were applied to the stereotactic frame and the working stage. After MER procedures, the permanent electrodes were implanted. Regular induction and endotracheal intubation for GA were performed and then maintained with a volatile anesthetic agent (desflurane or sevoflurane) and muscle relaxant only. The depth of anesthesia was monitored by the BIS. HR and MAP were recorded before and after each PROM. Each microelectrode had a 10 mm bare tungsten tip and was 10 to 40 μm in diameter; the recording impedance was 0.5–1.5 MΩ (FHC, USA). The microelectrode was mounted on a microdriver. The signal recorded from the tip of the microelectrode was magnified and displayed by a Leadpoint intraoperative microrecording system (Medtronic). PROM was performed on both the upper and lower limbs to see if there was movement-related neuronal firing. Raw spike firings in the STN were transmitted through a Power 1401 High-Performance Data Acquisition Interface (CED, England) for off-line analysis by Spike 2. The microelectrode was advanced from a distance of 200 to 500 μm to detect the robust firing of neurons. After electrode implantation, intraoperative fluoroscopy was used to record the position of the microelectrode tip, which served as a reference for final electrode implantation. A macrostimulation test was not performed. The length of the recorded STN had to be at least 4.5 mm to be considered adequate for a good clinical outcome. Ten seconds of STN neuronal firings were recorded by MER before (baseline) and after PROM [Figure 1]. At the same time, the BIS, HR, and blood pressure were collected through Biopac amplifiers then through an AD converter (CED Micro 1401) to be stored for off-line analysis. Brain CT in 1.25 mm consecutive slices was performed before the patient was sent to the ward, to exclude intracranial complications and to evaluate the initial postoperative electrode coordinates through image fusion with the preoperative MRI. Another MRI was done to confirm the final electrode coordinates within 3 months postoperatively. Paired t-tests were used to compare the pre- and post-PROM changes in the HR, MAP, BIS, and MAC of the volatile anesthetic agent. P < 0.05 was considered statistically significant. A total of 10 patients (female/male: 3/7) were enrolled in this study. Their mean age at surgery was 48.5 ± 10.8 years and mean disease duration was 8.6 ± 2.4 years [Table 1]. The average MER trajectory tract was 1.1 ± 0.2 for each side and recorded depth of the STN was 5.5 ± 0.8 mm. 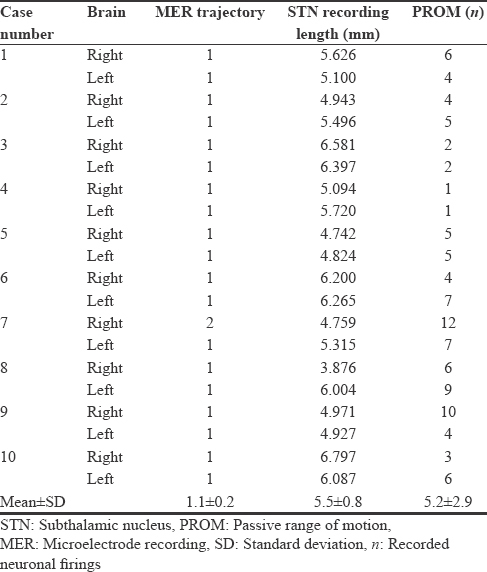 A total of 103 MER neuronal firings were recorded with and without PROM [mean = 5.2 ± 2.9, [Table 2]. When compared to baseline (without the PROM test), PROM increased the HR by a mean 0.5 beats/min and MAP by a mean 1.4 mmHg (P = 0.1178 and 0.0525). The associated change in the BIS was − 0.7 (P = 0.4941) and the MAC of the anesthetic agent changed little throughout surgery (P = 0.1825) [Table 3]. No patient was awakened during any PROM test. This was the first report showing the effect of PROM on the level of anesthesia during MER under GA. We proved that, under light anesthetic conditions such as between 0.5 and 0.7 MAC, we could obtain effective provoked neuronal firings to identify the somatosensory STN. In addition, PROM did not alter the stable anesthetic status of the patient, as measured by the BIS, HR, and MAP. Our results also answered skepticism on whether the depth of anesthesia would be so light that the patient might awaken during successful MER under GA. The depth of anesthesia is defined as the degree of central nervous system depression by an anesthetic agent. The BIS was introduced in 1992 to monitor the depth of anesthesia. This index is an arbitrary number from 0 (isoelectric) to 100 (awake). Our patients were maintained between a BIS reading of 33–62 during PROM, which might indicate that those patients were in a properly hypnotic state. Since the BIS is a measurement comprising electromyography and electroencephalography, it might sometimes be misrepresented. For example, using medications for neuromuscular block would lead to declines in the BIS in awake persons. Concomitant monitoring with HR and MAP could be a convenient and effective alternative to the BIS, and it has been suggested that standard clinical monitoring may have effects similar to electrical monitoring in preventing the risk of awareness during surgery,. In this study, there were no significant changes in HR and MAP before or after PROM during MER. These patients reported no awareness during surgery. However, there is still controversy in the literature regarding the efficacy of the BIS in monitoring awareness under general anesthesia. The score may not truly represent the level of consciousness. Rare cases of contradictory scores versus level of consciousness have been reported. Despite the aid of HR and MAP, the reliability of BIS monitoring in assisting measurement of awareness or an asleep state requires further verification. It is well documented that, during awake MER procedures, active or passive movement-related changes in neuronal firing within the STN can be indicated as a typical neuronal firing originating from the sensorimotor portion of the STN,. We proved in our earlier report that, under volatile inhalation general anesthesia, typical STN firing patterns could be properly observed and triggered by PROM, with clinical outcomes comparable to STN-DBS under awake procedures,. Thirty years after the first DBS paper was published at 1987, issues about patient comfort have elicited concern about whether an “awake' surgical technique is still necessary to obtain reliable and accurate MER signals followed by test stimulation. A recent meta-analysis by Ho et al. revealed that only 16 of 145 validated studies between the years 2004 and 2015 were related to GA. They concluded that DBS under GA may lead to a lower complication rate and there were no significant differences in clinical motor outcomes between awake DBS and DBS under GA. DBS should be recognized as a minimally invasive procedure only if patients can accept the surgery without fear and discomfort. We hope the evolution from awake STN-DBS procedures to surgeries under general anesthesia will become a trend and help provide the benefits of DBS to neuropsychiatric patients who are not suitable for awake DBS. This study had some limitations. First, we designed this study to record both clinical and neurophysiological data, which resulted in a small group of patients. Second, we followed this small cohort without including a control group. Both caveats might explain the insignificant statistical results. PROM was effective in triggering and magnifying neuronal firing signals without influencing patient awareness during MER for STN-DBS under GA. GA is suggested as an alternative choice for the comfort of patients and still ensures uncompromised clinical outcomes. Chen SY, Lee CC, Lin SH, Hsin YL, Lee TW, Yen PS,et al. Microelectrode recording can be a good adjunct in magnetic resonance image-directed subthalamic nucleus deep brain stimulation for parkinsonism. Surg Neurol 2006;65:253-60. Hutchison WD, Allan RJ, Opitz H, Levy R, Dostrovsky JO, Lang AE, et al. Neurophysiological identification of the subthalamic nucleus in surgery for Parkinson's disease. Ann Neurol 1998;44:622-8. Starr PA, Theodosopoulos PV, Turner R. Surgery of the subthalamic nucleus: Use of movement-related neuronal activity for surgical navigation. Neurosurgery 2003;53:1146-9. Ho AL, Ali R, Connolly ID, Henderson JM, Dhall R, Stein SC,et al. Awake versus asleep deep brain stimulation for Parkinson's disease: A critical comparison and meta-analysis. J Neurol Neurosurg Psychiatry 2017. pii: jnnp-2016-314500. Chen T, Mirzadeh Z, Chapple K, Lambert M, Ponce FA. Complication rates, lengths of stay, and readmission rates in “awake” and “asleep” deep brain simulation. J Neurosurg 2017;127:360-9. Lin SH, Chen TY, Lin SZ, Shyr MH, Chou YC, Hsieh WA,et al. Subthalamic deep brain stimulation after anesthetic inhalation in Parkinson disease: A preliminary study. J Neurosurg 2008;109:238-44. Chen SY, Tsai ST, Lin SH, Chen TY, Hung HY, Lee CW,et al. Subthalamic deep brain stimulation in Parkinson's disease under different anesthetic modalities: A comparative cohort study. Stereotact Funct Neurosurg 2011;89:372-80. Eger EI 2nd, Saidman LJ, Brandstater B. Minimum alveolar anesthetic concentration: A standard of anesthetic potency. Anesthesiology 1965;26:756-63. Mukamel EA, Pirondini E, Babadi B, Wong KF, Pierce ET, Harrell PG,et al. Atransition in brain state during propofol-induced unconsciousness. J Neurosci 2014;34:839-45. Sanders RD, Tononi G, Laureys S, Sleigh JW. Unresponsiveness ≠ unconsciousness. Anesthesiology 2012;116:946-59. Whitlock EL, Villafranca AJ, Lin N, Palanca BJ, Jacobsohn E, Finkel KJ,et al. Relationship between bispectral index values and volatile anesthetic concentrations during the maintenance phase of anesthesia in the B-unaware trial. Anesthesiology 2011;115:1209-18. Schneider G, Jordan D, Schwarz G, Bischoff P, Kalkman CJ, Kuppe H,et al. Monitoring depth of anesthesia utilizing a combination of electroencephalographic and standard measures. Anesthesiology 2014;120:819-28. Horn B, Pilge S, Kochs EF, Stockmanns G, Hock A, Schneider G,et al. Acombination of electroencephalogram and auditory evoked potentials separates different levels of anesthesia in volunteers. Anesth Analg 2009;108:1512-21. Messner M, Beese U, Romstöck J, Dinkel M, Tschaikowsky K. The bispectral index declines during neuromuscular block in fully awake persons. Anesth Analg 2003;97:488-91. Messina AG, Wang M, Ward MJ, Wilker CC, Smith BB, Vezina DP, et al. Anaesthetic interventions for prevention of awareness during surgery. Cochrane Database Syst Rev 2016;10:CD007272. Chhabra A, Subramaniam R, Srivastava A, Prabhakar H, Kalaivani M, Paranjape S,et al. Spectral entropy monitoring for adults and children undergoing general anaesthesia. Cochrane Database Syst Rev 2016;3:CD010135. Schneider G. Bispectral index aware or minimum alveolar concentration aware? Alerting thresholds for prevention of awareness. Eur J Anaesthesiol 2015;32:301-2. Avidan MS, Jacobsohn E, Glick D, Burnside BA, Zhang L, Villafranca A,et al. Prevention of intraoperative awareness in a high-risk surgical population. N Engl J Med 2011;365:591-600.